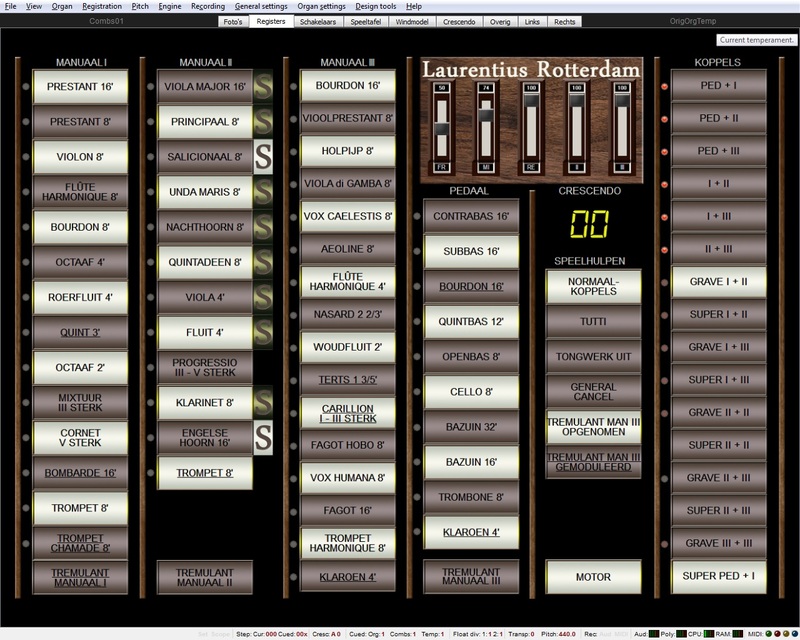 Picture Hans Kleene December 2017 we have recorded for Hauptwerk the main organ of the Laurentius & Elisabeth Cathedral situated Mathenesserlaan 305 in Rotterdam. The organbuilder Elbertse of Aalten built a pneumatic organ with 30 stops on two manuals an pedal in 1923. The pipe facade was designed by the church's archtect P.G. Buskens. An extensive transformation took place in 1997/98, executed by the organbuilders Adema Schreurs from Amsterdam with help from many parish volunteers. The disposition of the Swell (now third manual) was reconstructed and a french Fagot 16' and Trompet harmonique 8' were added. The existing Hobo 8' was replaced by a french Hobo. The pedal Open Fluit 4' was replaced by a Trombone made from pine-wood. The Bazuin 16' was extended with a subcontra-octave to provide the transmission of a Bazuin 32'. The largest 12 pipes of this stop are also made of pine-wood. 2. The current disposition: (Blue marked stops are added for Hauptwerk). This sample set was recorded from three positions in stereo (24 bit 96kHz). The set comes with a Sygsoft devised 3-channel technique whereby the user may set the listening position themselves. 1: Front, recorded very close to the organ. This provides a very direct recording that is useful for study purposes. 2: Centre (Middle), this recording was made at about 3 times the distance used in the front recording. 3: Rear, recorded far from the organ is used as surround. Through three sliders (0-100%), a mix can be made of the three positions that is to your liking. The 4th slider (with the caption "II") is the swellpedal of manual II. The 5th slider (with the caption "III") is de swellpedal of the Swell (man. III). The recordings for this sample set were made in december 2017. Recording quality 96 kHz, 24 bit. The set is reduced to 48 kHz 24 bit. Christian Boogaard: Noise reduction, demos and artistic advice. Johan van der Waal van Dijk: processing of samples and technical advice. Rietje Raatgeep: responsible for the loops in the samples. Fred de Jong: Layout, ODF as well as customizing the website and general management. Fred de Jong March 2019.